This is my review of the HSBC Premier World Elite Mastercard credit card. Key facts: £195 annual fee, card only available to HSBC Premier current account holders. The fee is waived if you have £500,000 in a HSBC savings or investment account and have been given free ‘Jade’ status. The representative APR is 59.3% variable, including the annual fee, based on a notional credit limit of £1,200. 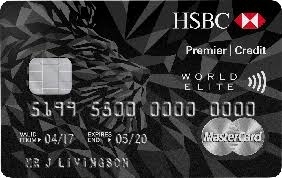 The HSBC Premier World Elite Mastercard is issued by HSBC. There are two versions of the card. This review covers the more generous, premium version. There is also a free version called the HSBC Premier Mastercard which I review here. You cannot have both versions of the card at the same time. It is a bit of an oddity amongst all of the other credit cards covered in this series for two reasons. The first is that the airline rewards programme – whilst VERY generous – is a sideshow to the rest of the card. The second is that the card can only be obtained if you have a HSBC Premier bank account. HSBC Premier has tough eligibility criteria. See here and click on the ‘Eligibility criteria apply’ link to see the details. Alternatively, if you earn over £75,000, you qualify if you just have a HSBC mortgage or any investment or insurance product. HSBC has been known to waive the income criteria if you are on a career path which should see you earning this sort of money within a few years. What is the HSBC Premier World Elite sign-up bonus? The sign-up bonus is VERY impressive. You can earn up to 40,000 Avios or other airline miles in your first year. You will receive 40,000 HSBC points, which convert into 20,000 Avios or other airline miles (Asia Miles, Etihad Guest, Singapore KrisFlyer) if you spend £2,000 within your first three months. You will receive an additional 40,000 points, worth an extra 20,000 Avios, if you spend a total of £12,000 in your first year. These will not arrive in your account until after your 12 months of membership irrespective of how quickly you hit the spending target. This means that you are committed to paying the annual fee for the 2nd year to receive the second part of the bonus. Yes. You will receive access via the LoungeKey scheme to a large number of airport lounges. I discussed the UK lounges which accept LoungeKey in this article – it is a decent list. No free guests are allowed into the lounges. However, you can get a supplementary card for your HSBC Premier World Elite Mastercard for a £60 annual fee and that person can then access lounges with that. The HSBC Premier World Elite Mastercard is not clearly better than American Express Platinum if you want a card with airport lounge access. It is cheaper (£255 for the HSBC card with one supplementary card vs £450 for Amex Platinum) but the Amex Platinum package has far more benefits – Hilton Honors Gold, Melia Rewards Gold, Radisson Rewards Gold, Marriott Bonvoy Gold, Eurostar lounge access etc (see my American Express Platinum review for details). For some people, however, HSBC Premier World Elite will be the right choice if you want airport lounge access. If you have children, note that there is no way of getting a child into an airport lounge for free with LoungeKey. You are forced to pay the £15 guest charge, because obviously a child cannot be made a supplementary cardholder on your credit card account. With the Priority Pass issued by American Express Platinum, children can get into lounges for free – you get two cards and each is allowed one free guest. I discussed the Mastercard UK World Elite benefits in this article. You access them via this special UK Mastercard website. What is the HSBC Premier World Elite annual fee? £195. This is waived for HSBC Jade customers, but this requires you to have at least £500,000 invested or on deposit with HSBC. There is no fee for the HSBC Premier bank account which you also need to hold, as long as you meet the eligibility criteria above. If you currently pay for a ‘packaged’ current account with another bank you may save money by moving across. HSBC Premier World Elite rewards scheme gives 2 points for every £1 spent in the UK and 4 points for every £1 spent abroad. Each point is worth 0.5 airline miles. This means that you earn 1 mile per £1 for UK spend and 2 miles per £1 for foreign spend. At 1 Avios point per £1 spent, and 2 Avios per £1 for foreign spending, this is the most generous way to earn Avios via a Visa or Mastercard. The free HSBC Premier card only offers 0.5 Avios per £1. The Tesco Clubcard Mastercard only offers 0.312 Avios per £1. You actually receive less because of the way it rounds down transactions to the nearest £8 – purchases under £8 earn nothing! This post outlines my view of what an Avios point is worth, based on your typical redemption patterns, should you be thinking of converting your HSBC points to Avios. For an average spender, the HSBC Premier World Elite Mastercard offers value as long as you believe that you can justify the £195 annual fee. This means that you need to place a lot of value on the LoungeKey airline lounge membership. Unless you are spending a six figure sum on your credit cards annually, paying £195 purely to receive 1 Avios point per £1 does not make sense. For the first year, however, it is a different story. Earning 40,000 Avios or other miles as a sign-up bonus – as long as you can hit the £12,000 spending target – makes the £195 fee good value. IMPORTANT – if you are just considering getting the card for one year, remember that you don’t receive the 2nd part of the bonus until your first 12 months is over. You should anticipate having to pay the fee for the second year, which is not refundable. Yes, to the extent that you receive double points for foreign spending. However as HSBC adds a 3% foreign exchange fee, you might want to get a separate free credit card to use abroad. Unfortunately there are no travel rewards card without a foreign exchange fee. One option is to get a free Curve Card – see this HFP article – and link it to a miles-earning Visa or Mastercard. The Starwood Preferred Guest American Express credit card offers 30,000 points for signing up. These convert to 10,000 miles in 40+ different airlines, including KrisFlyer, Asia Miles and Etihad Guest, as well as Avios. It has a £75 fee, refunded pro-rata if you cancel. A sign-up bonus of 40,000 airline miles – even with a £195 annual fee and £12,000 spend target – deserves to be looked at closely. Unless you are already a HSBC Premier customer, however, you need to weigh up whether you really want to move your banking over to HSBC for a benefit lasting only one year. I think most people would struggle to justify the £195 fee for the second and subsequent years. The application for the the HSBC Premier World Elite Mastercard can be found here. It seems they have updated their terms and conditions to be clear about the fact that it is paid ‘within 60 days of the First Anniversary of your account being opened’ rather than ‘within 60 days from point of qualification’ as it used to say. It seems they have updated their terms and conditions to be clear about the fact that the second bonus is paid ‘within 60 days of the First Anniversary of your account being opened’ rather than ‘within 60 days from point of qualification’ as it used to say. Yes they have – finally! back to the point – I’m wondering if you would do an article on citi banking products (i know… you need 150kGBP.). I just started looking into it because here in HK we just started having a few banks giving miles as part of the welcome offer for banking products. Been a Citi customer in the UK for 20+ years. Great for £ $ € accounts all linkable to the same debit card. But they have no branches in the UK, and no cheques, I know you hardly ever need a cheque, but occasionally you do, so you really need a second account somewhere else. Lots of tales of them closing accounts without explanation, common accepted reason is no profit for them, I personally have never paid them a penny in fees or charges, so all they make from me is some minimal FX spread, and ???. Maybe if you’re a real high net worth individual they may be right for you, but as a mainstream UK bank they’re pointless. I always wonder if people with serious 6 and 7 figure salaries care about 100K Avios. Rob? In a way i agree. I was a citi general banking customers in HK for years some 10 years ago before I was in the UK for studies. I figured this bank is generally useless for day-to-day purposes whilst my time in London. but since one of the niche function for HSBC is global transfers/global banking, citi would stand as a good competitor especially if you need to head west. Are people with serious salaries care about 100K avios? I think it would just be a package of interest rate/what not and is what HfP is about. I know there are readers who uses avios as a payment leverage for holidays. They may not all read the comments but surely they would look at the title of the posts and see if they are interested. Do the bonuses apply when upgrading from the free card? Not clear, at least to me. Looking at the T & Cs of the Elite card I would say they do. In fact, I think it is also ‘churnable’ every 6 months. Criteria is that you haven’t had an Elite card for the last 6 months prior to applying. It does. Upgraded to the WE card from the free one and got the sign up bonus. I have HSBC premier and this card. On the qualification point, I have a measley £300 in shares in an HSBC sharedealing account. I haven’t traded anything since before I opened the account, and it was enough to qualify me on that criteria. I have also just applied for a mortgage as they are 0.01% off the market-leading rate for the product I wanted. Applied online and the whole thing took 7 working days from submission to approval. Pretty happy with the account in general but not sure if I can keep justifying the big annual credit card fee. It’s not very succinct but I would say you have a choice of £195 for 20k and a year of 1avios/£ or the 2yr choice to double that. Crucially they have the occasional bonus on transfers to BA: 25% this year. So I would take the card on the 2yr play – then you have 2 years to hopefully get much of your point transfer (and your regular spend accruals) uplifted. Yes, I find it difficult to say £390 fee and £12k spending for 40k miles is ‘very generous’ vs Amex Plat x2 over the same 13 month period with pro rata reduced fee. This is not an Amex though ….. It is also worth mentioning that the Premier account includes decent worldwide travel insurance for the family. This, together with the Avios and lounge access benefits of the card start to put it on a par with Amex platinum. Certainly, for people with the HSBC Premier World Elite Mastercard there’s less value in also having the Amex platinum card. The HSBC website makes no mention of the “World Elite VIP Privileges” that are apparently available to all World Elite Mastercard cardholders in the UK. When I type in the first six digits of my card number into the form, I get an error. Is that not just the IHG offer open to all MC types? Yes, I’ve just spoken to MasterCard and they said HSBC have not authorised the World Elite WIP Privileges, that are apparently available to all cardholders. The free travel insurance is only up to age 70. But if you have “Jade” status, then it goes to age 80. The simplest way to get “Jade” is to move your ISA to HSBC, assuming it is large enough of course. Forgot the iPass Wifi benefit. For standard ground based Wifi this is not much of a benefit as mostly free or inclusive. But for air inflight Wifi this is a benefit. Includes all major ariline where their still tends to be fee for service so this benefit poses a saving. A PDF document explaining how to claim these benefits can be downloaded here. Yes, that article needs an update. On the 75k criteria where article states earned, IIRC and just to clarify that this is income after tax. Wait, is that true? The website says “an individual annual income of at least £75,000”, I read this as pre-tax. I take it as pre-tax. I know someone on £76k gross who recently got Premier, so looks like pre-tax. I get mine as a by-product of having worked for HSBC in the past so I’ve no idea what the criteria are for civilians! Did you set the currency in your Curve app for the card in question to Pounds or Euros? Or Canadian Dollars? Some prem world elite cards are on a BIN previously used by a Canadian Bank. I set the currency in the Curve app as GBP. The transactions I paid for with Curve card were in PLN. Very strange – puts me of using it now. Agree seems very strange, so they showed up as GBP transactions but you were still charged a forex fee? That would definitely put me off the card! That’s odd. I’ve got the same setup and when using my Curve x HSBC Premier card in Singapore, I have not had any additional charges. Curious you mention there are no Citibank branches in the UK @Doug M? Have Citibank closed the branches that were in London? Interestingly if they have no branches, Citibank seem to be have some success grabbing employee-issued expense cards off of Amex in the UK. I’ve worked in 2 or 3 very large corporates in the past year that had taken their employee cards out of Amex into Citibank. Used all closed unless citigold where you can go to their Canary Wharf branch.